Ranveer Singh and his rumoured girlfriend Deepika Padukone have been inseparable since Sanjay Leela Bhansali's 'Goliyon Ki Raasleela', but the duo has always maintained a stoic silence over their relationship. Not just by holding hands at the airport or getting clicked on vacations, the two can also be seen expressing their love by constantly commenting on each other's posts on Instagram. 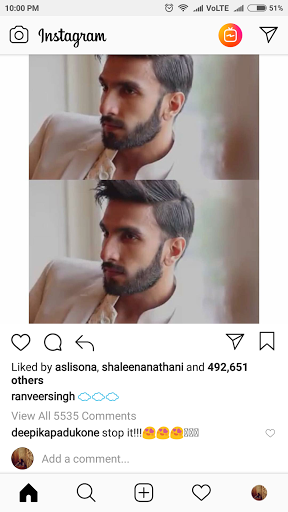 Recently, 'Piku' star Deepika wrote 'STOP IT' to Ranveer, who had posted a debonair and suave looking picture of him on his social media account. Seems like Deepika went head over heels after looking at Ranveer's recent picture as she writes, "stop it" with heart and drooling emojis. On the work front, Deepika has not announced her next project yet, while Ranveer's upcoming flicks include 'Gully Boy', 'Simmba', '83', Karan Johar's 'Takht'. While the two, were last seen in the controversial movie titled 'Padmaavat' which hit theaters on January 2018.